Well, it's a week later; my due date came and went, and I'm still pregnant. As it turns out, I can't control everything. 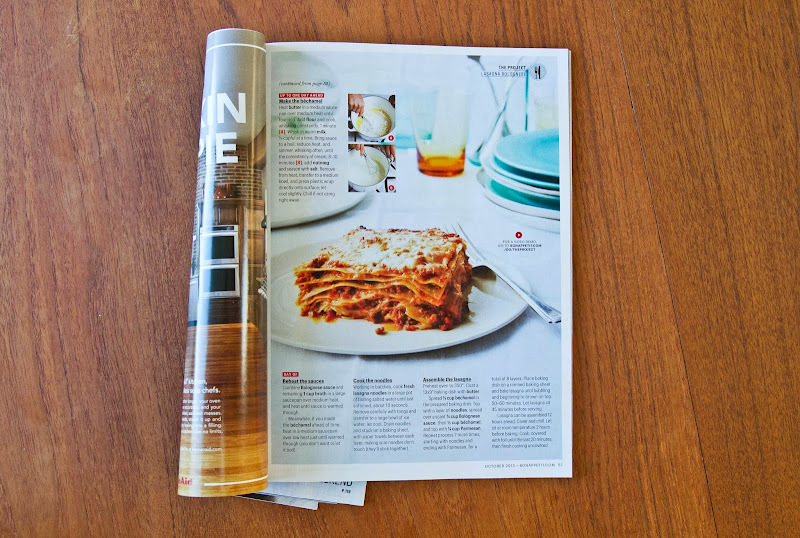 I can, however, make a delicious lasagna Bolognese. 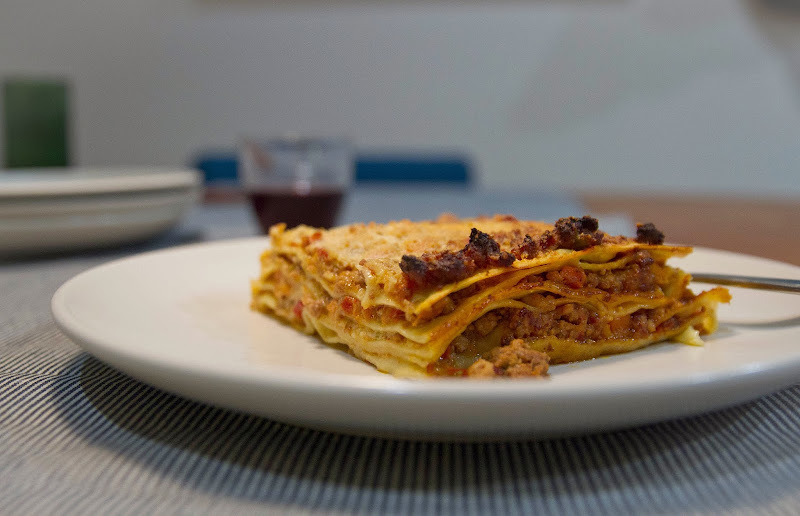 As you may recall, I already tackled Bolognese, but as this was a whole new recipe and one that had me use the meaty sauce in a lasagna, I felt it was fair game for a new bon appétempt. 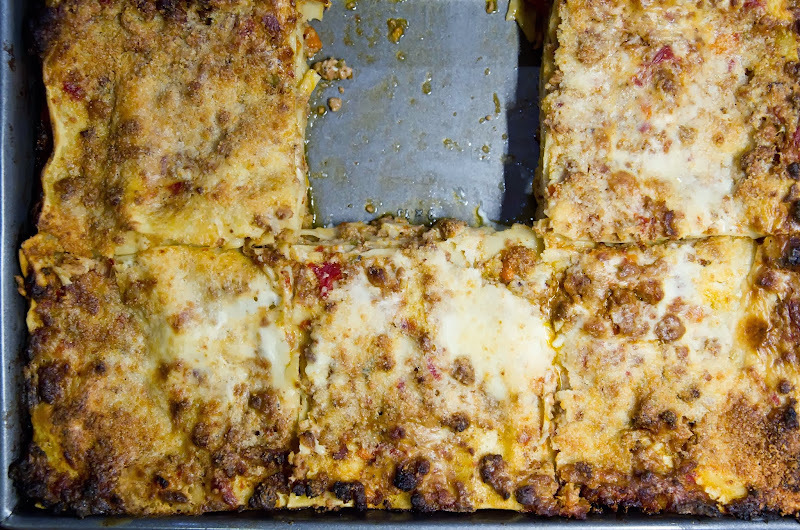 The virtues of lasagna seem endless. 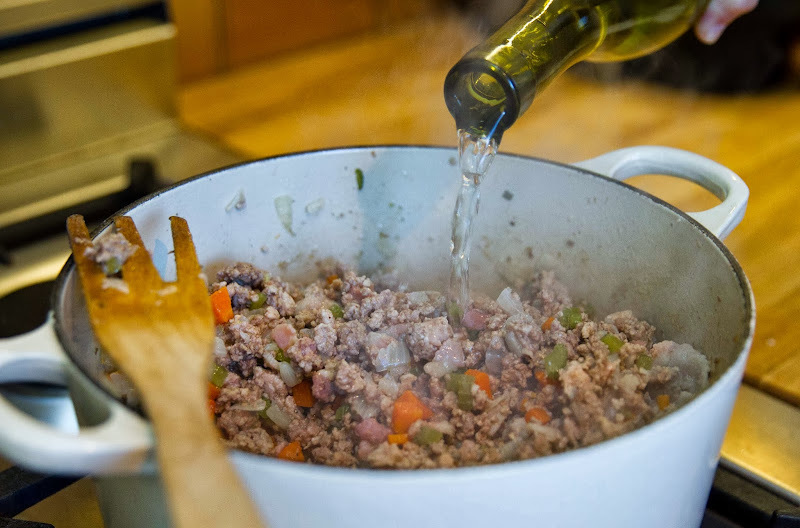 Not only can you make most of the components ahead of time (This recipe actually calls for the Bolognese to have 12 hours in the refrigerator to ruminate about its potential), but once it's assembled, there's still no major rush to getting it in the oven. Then, once it's baked, it needs some more time to itself at room temperature. Oh, what's that? You made too much? 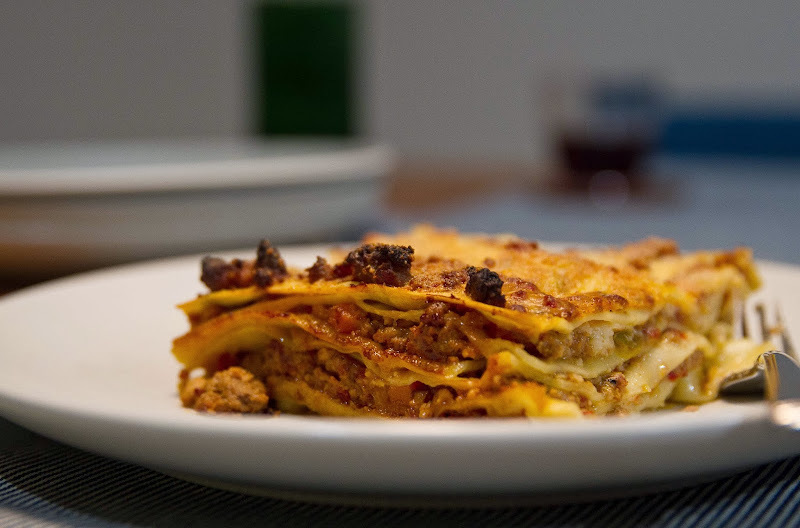 No worries, lasagna is also great the next day or the day after. It's like some kind of miracle dish. 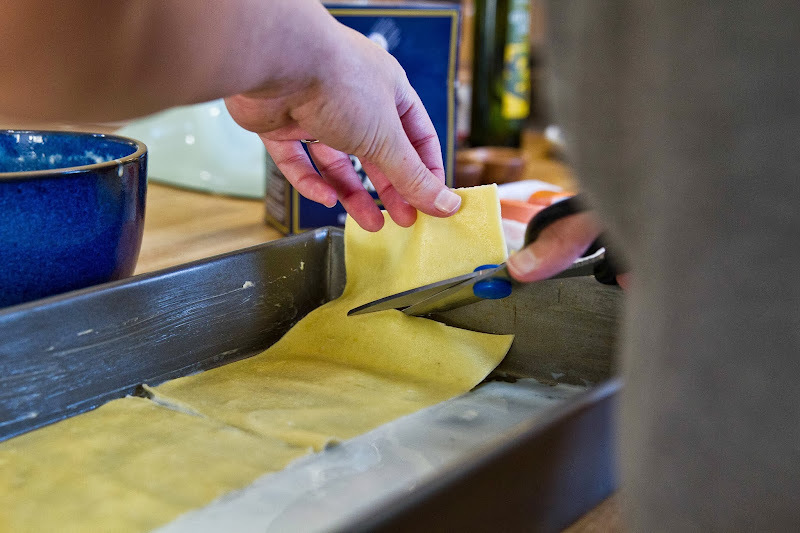 The only thing that was maybe a bit of a pain was boiling the fresh lasagna noodles, which I had to do in batches and then spread in between damp layers of paper towels until I was ready to assemble it all. But then again, after the noodles were boiled came the best part about making lasagna: building it. Point being, 40 weeks and 3 days pregnant or not, I think this lasagna can teach us a lesson or two in the art of good things coming to those who wait. So, g'head, start making your version this weekend! 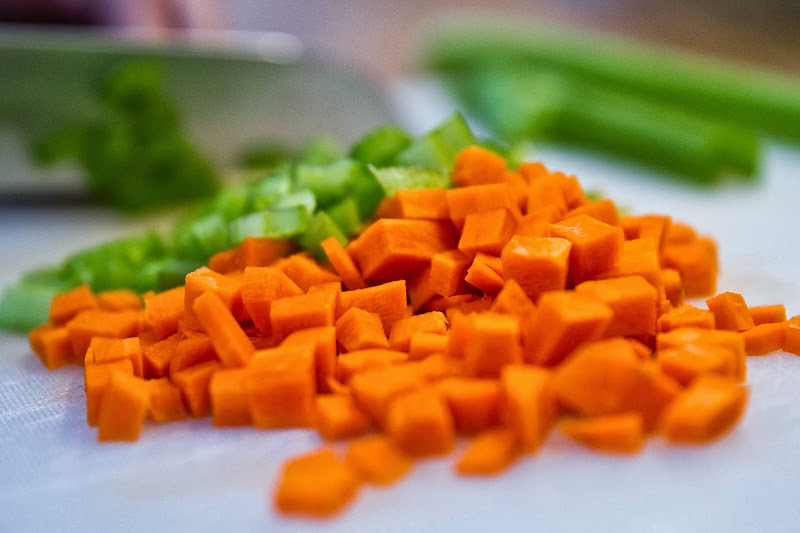 Make the Bolognese sauce: Pulse onion, carrot, and celery in a food processor until finely chopped. Add wine to pot and bring to a boil, scraping up browned bits from bottom of pot, about 2 minutes. 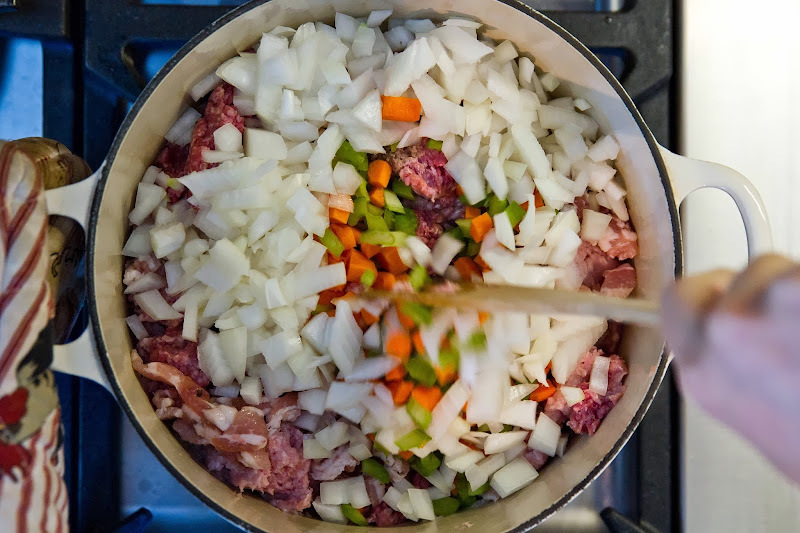 Add milk; bring to a boil, reduce heat, and simmer until moisture is almost completely evaporated, 8–10 minutes. 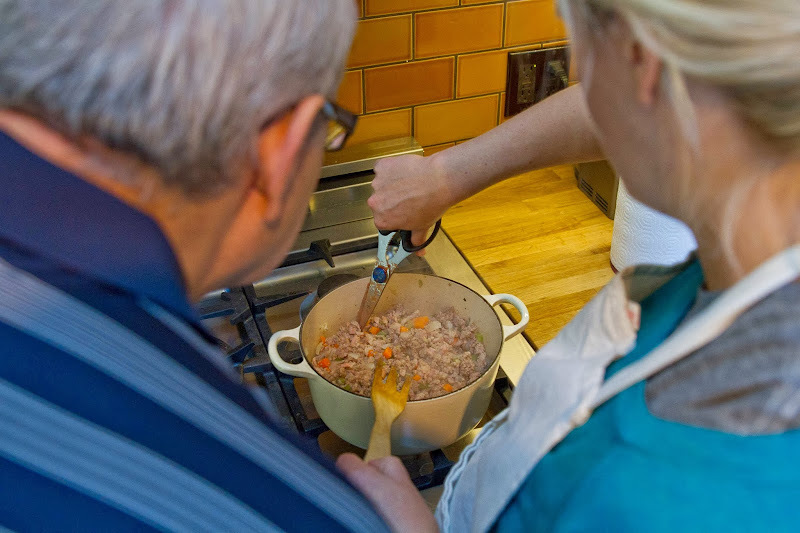 Add tomatoes and 2 cups broth; bring to a boil, reduce heat, and simmer, adding water by 1⁄2-cupfuls if sauce looks dry, until flavors meld and sauce thickens, 2 1⁄2–3 hours. 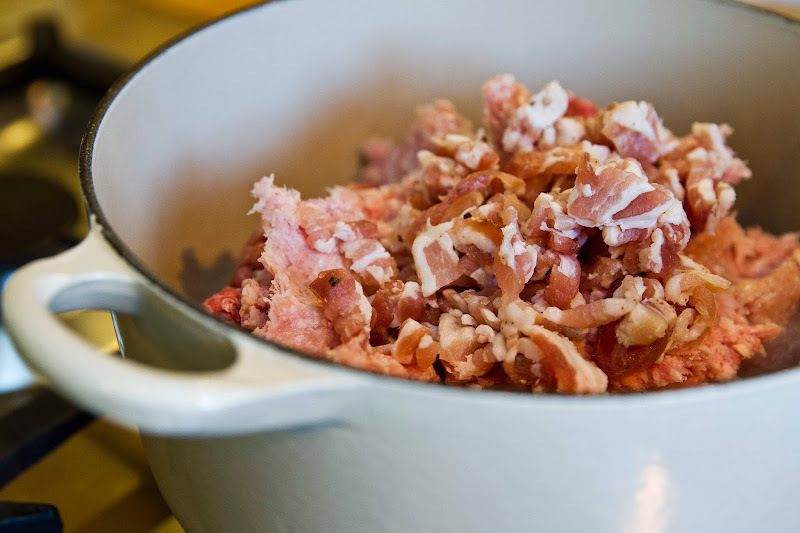 To make the béchamel:Heat butter in a medium saucepan over medium heat until foaming. Add flour and cook, whisking constantly, 1 minute. Whisk in warm milk, 1⁄2-cupful at a time. Bring sauce to a boil, reduce heat, and simmer, whisking often, until the consistency of cream, 8– 10 minutes; add nutmeg and season with salt. Remove from heat, transfer to a medium bowl, and press plastic wrap directly onto surface; let cool slightly. Cook fresh lasagna noodles according to packaging. Drain noodles and stack on a baking sheet, with damp paper towels between each layer, making sure noodles don’t touch (they’ll stick together). 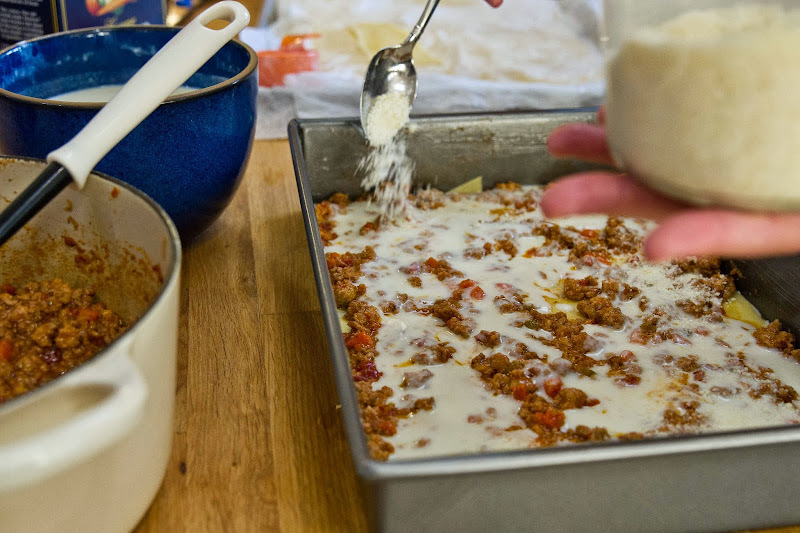 Spread 1⁄4 cup béchamel in the prepared baking dish. 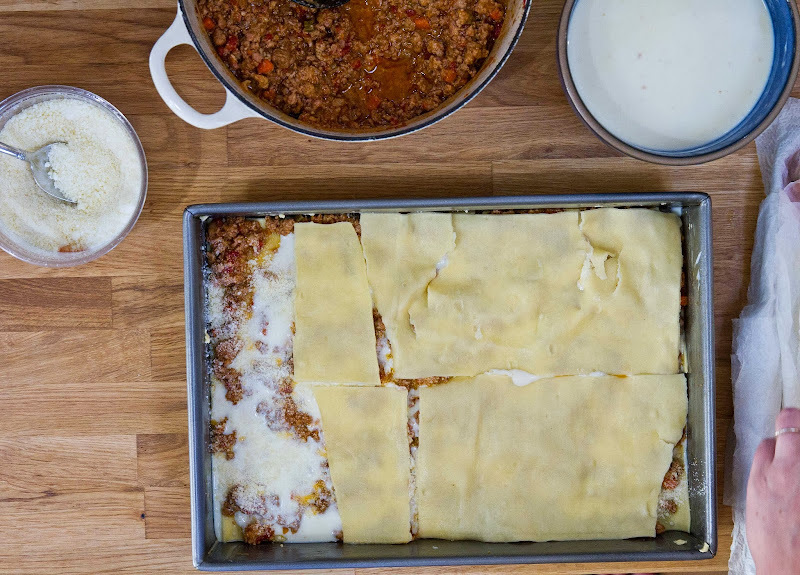 Top with a layer of noodles, spread over a scant 3⁄4 cup Bolognese sauce, then 1⁄2 cup béchamel, and top with 1⁄4 cup Parmesan. Repeat process 7 more times, starting with noodles and ending with Parmesan, for a total of 8 layers. 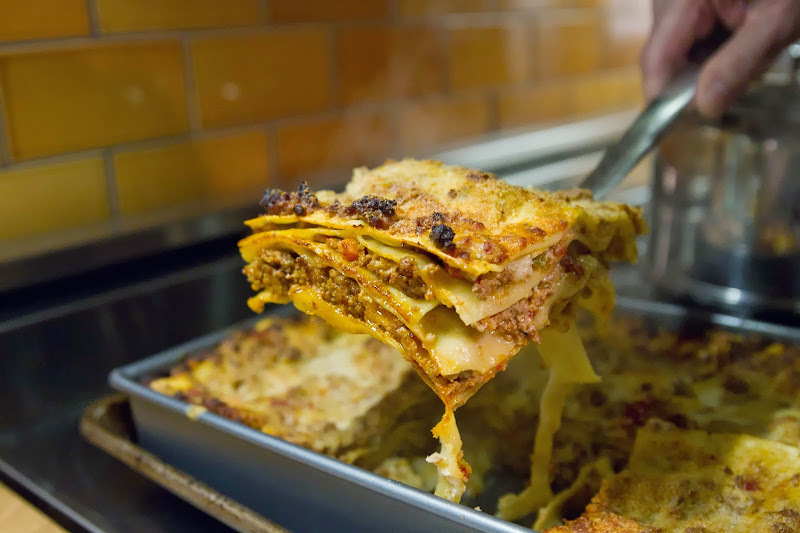 Place baking dish on a rimmed baking sheet and bake lasagna until bubbling and beginning to brown on top, 50–60 minutes. Let lasagna sit 45 minutes before serving. NOTE: Lasagna can be assembled 12 hours ahead. Cover and chill. Let sit at room temperature 2 hours before baking. Cook, covered with foil until the last 20 minutes, then finish cooking uncovered. Can we have this tonight? Pleeeeeeze? Hahaha!! "Ruminate about its potential..." Also, that screen shot is the best! When I was overdue I suddenly went on a cooking binge that involved me making 3 different lasagnas for our freezer. I paid for it that night, but when I finally had the baby (41 weeks 5 days right here!) I was SO glad to have them at the ready, even if it did result in lasagna fatigue after a while. 6 months later I am finally feeling up to some lasagna again, might have to rock this one out this weekend. Sending labor juju your way. Good luck and good birth! This would be good with a nice gallon or two of red raspberry leaf tea, maybe? : D Good luck and congratulations in advance! I have a special place in my heart for overdue moms....I am an ob nurse and I have 4 kids, all of which were overdue! I was suppose to be a January 1 baby but was overdue by 3 weeks! I'm sure your babe will be out in no time! Can't wait to meet the little one! Oh my gosh I've been wanting to make this since I saw it in BonApp. Now I'm even more determined. Happy upcoming Baby! My younger son is 7 now, and I STILL talk about the fact that he was born at 41 weeks! His due date was November 29th & he was born on December 6th. Since he was my 2nd baby, I really thought I'd have him before Thanksgiving....nope! I was as big as a house & only able to eat tiny amounts because he was taking up All of the Room (and giving me wicked heartburn). Am regularly visiting your blog and grasp the things which is useful to me. i love to read your post and am trying to do it. impressive one. Thanks for sharing.